Does Sparky’s 40 Game Rule Actually Work? Through 40 games, the Tigers have a .575 winning percentage. That’s a 93 win pace. If you go by the projections, they’re on an 88 win pace including the wins they’ve already bagged. There’s so much that can happen between now and the end of the season, like injuries to key players and significant trades. For now, they’re playing like a good team and they probably are one. They’re short of great, but plenty good. They’re 3rd in baseball with a 111 wRC+ and they’ve been average or a little better depending on how you like to measure pitching. But Sparky said he knew what type of team he had after 40 games and that’s where we are right now. Based on what we’ve seen, the Tigers have flaws but they are certainly contenders. But before we go, was Sparky right? Can you tell what kind of team you have after 40 games? Let’s look back at the 114 year history of the Tigers. It’s an R^2 of .50, if you’re into that kind of thing (and if you are willing to assume linearity). Basically, you an explain about half of a team’s won-loss record by their first 40 games. If it had no bearing on their future won-loss record, that R^2 would be closer to .25 because 40 games is about one quarter of a season. 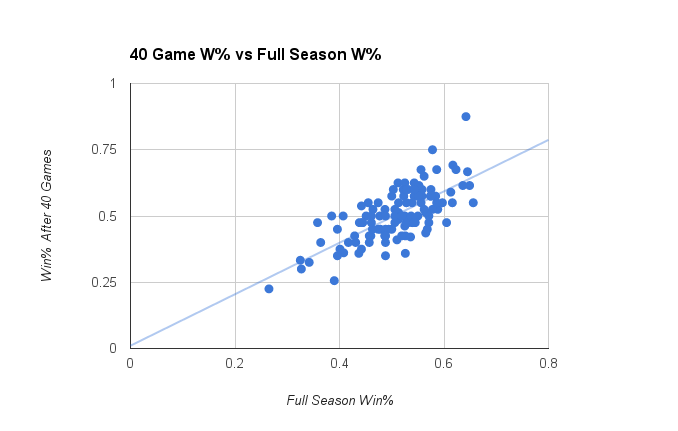 If you correlate the first 40 with the rest of the season, you get an R^2 of about .22. In other words, the first 40 games are a decent proxy, but nothing is carved in stone.